Finally we seem to have spring in the air and earlier this week we reached a special birthday with our yearling, Sully as he celebrated his second birthday with us. It only seemed a minute ago he was a foal and we went to the breeder to meet him as a little 3 month old colt and now, here he is, a big boy at two years old. He’s really coming on and now as he moves out of his ‘yearling’ stage he becomes officially a youngster. It’s always a time for reflection on a birthday. I’ve been looking back at photos on Facebook reminding me of what we have achieved in our short time together. He’s already done his first county show age one and was out in the ring as a foal before then, teaching him to load and tie up and trying to teach him to trot has been a lot of hard work and fun. Giving him his first bath, plaiting him up and getting him in a little bridle has all been a learning curve for us both. He’s been to the British Appaloosa Society breed show last year where he came third in the youngstock class. This season we are so behind on where we are, having no ménage to practice in and all the wet weather we have seen – it has meant the ground has been too slippy to start running up and down on and far too dangerous. However, as we see the ground dry up we will be able to get going again and get out and about this year with a bit more experience under his belt. We’ve seen lots of shows cancelled due to the wet weather and I guess most people haven’t bee out as much as they usually are. We haven’t been able to join pony club so far this season as both my daughter, Alyssia, and her pony have had leg injuries. I’m looking forward to getting going again and being able to ride at home on the grass. 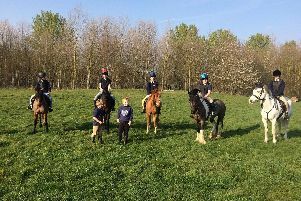 It seems that we have had to hack out forever and we’ve got lots of schooling to do to work on bending correctly with all the horses, and of course, running up and down with Sully.